With sustainability a full-blown movement right now (have you heard? It’s Plastic-Free July), it’s high time we embrace eco-living, and that extends to our travels too. At these stunning eco-luxe resorts and hotels, the word ‘sustainable’ refers to far more than just having environmentally friendly features. As put succinctly by the United Nations last year, sustainable tourism is also about “social inclusiveness, employment and poverty reduction” and “environmental protection and climate change”. These gorgeous resorts and hotels around the world have truly set the bar for sustainability. It’s impossible to disregard the Soneva brand when it comes to eco resorts — the hospitality group was one of the first to champion sustainable luxury resort living, and believes that “a business must exist for a greater purpose than shareholder returns.” Soneva Fushi gives value to waste; 90 percent of it is reborn. Used glass bottles are turned into kitchenware or art, leftover food is turned into compost to create fertile soil for the resort’s produce grown on-site. Soneva Fushi is also home to Soneva Foundation which distributes fuel-efficient cook stoves in rural Myanmar. One of its star social enterprises is Soneva Water, which makes water production more sustainable through a sophisticated solar-powered desalination water plant which gives the local community access to clean, filtered water and cuts down on thousands of single-use plastic bottles. 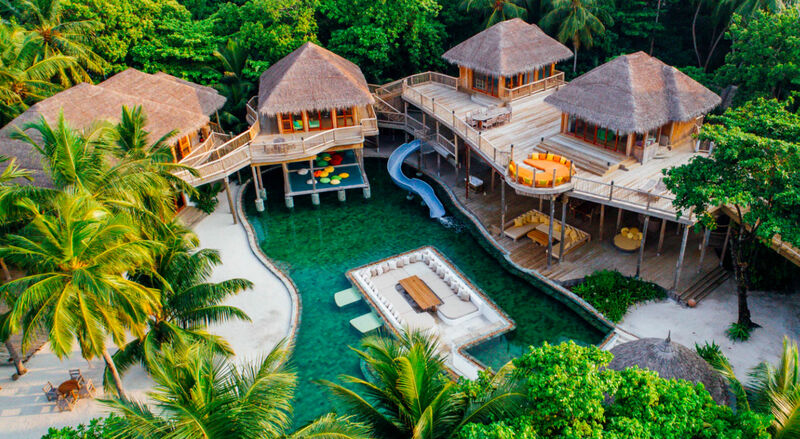 Of course, its colossal treehouse-like luxury villas don’t hurt either. Seeking a Maldivian paradise just hours from Singapore? You’ll find it at Song Saa Private Island. Founders Rory and Melita Hunter were the first private owners of an island in the Koh Rong Archipelago, and took on the responsibility of respecting the land and its inhabitants. Song Saa is devoted to sustainable and responsible tourism on all fronts. Let’s begin with design — the resort is primarily built on reclaimed materials. All of the floors in the villas are made from old, recycled housing materials, driftwood from nearby islands are given new leases of life as stools, sculptures and tables and salvaged wood from old fishing boats are made into panelled art. The resort also goes above and beyond your average CSR policies with its namesake foundation: Song Saa Foundation. Championing both the community and the environment, its commitment extends to marine conservation, mangrove and rainforest restoration, as well as initiatives to improve the lives of the local communities. These include offering abundant employment opportunities for locals on the resort, providing vital healthcare through its outreach clinics, and distributing learning aids and reading materials to children of the archipelago. The kingpin of the Bali high-design scene is more than its iconic overhanging cliff-side cabana. The famed resort was the first hotel in Indonesia to score the highest in the Earthcheck Certification: A global programme used to measure environmental sustainability. Perched on limestone cliffs overlooking the Indian Ocean, the luxury resort is the spot to be for glamorous sunset cocktails and unobstructed ocean vistas. Like garden sanctuaries, these airy one to three open-plan bedroom villas of private cabanas, pools and outdoor dining feature environmentally sustainable use of wood, water, flora, stone and air, and local and upcycled materials. The resort is also strict about its zero tolerance for waste, and runs a waste water management system which uses local plants from the Bali savannah ecosystem. The resort also regularly gives back to its community, by committing to R.O.L.E Foundation in supporting women in poverty with education, training and wage support, and the Bali Life Foundation orphanage. Tucked away in the foothills of the Cederberg Mountains, this quiet oasis is the South African retreat you’ve been dreaming of. Wake up in the wilderness — in the room, suite or villa complex of your choice, you’ll snooze among open plains, sandstone formations and ancient bush art sites harking back 10,000 years. Feel free to sleep with a good conscience here, as Bushmans Kloof is award-winning in the areas of conservation and community work. Its myriad initiatives include running an environmentally friendly solid waste disposal, organic farming and and most notably, the protection of Africa’s endangered wild animals. The reserve is the home of the Cape Mountain Zebra. Utter seclusion and splendour is what you’ll get at this ultimate Australian escape. The conservation-based resort takes up a mere one percent of its 7,000-acre nature reserve in the Greater Blue Mountains World Heritage Area, a 2.5-hour drive from Sydney. A tribute to traditional homesteads, the villas — ranging from the 83 metre square Heritage villas to the top-tier three-bedroom Wolgan Villa — are set against jaw-dropping views of a blue-hazed valley. The carbon-neutral resort was built with ecologically sustainable design principles in mind including solar panel usage and domestic water recycling. The resort’s devotion to conservation is remarkable — its measures to protect regional biodiversity and restore natural habitats have helped 1,500 native and endangered species.